This entry was posted on September 12, 2018 by ScienceofSpeed. 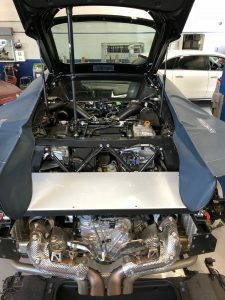 ScienceofSpeed applauds Acura and the Acura dealerships that are supporting the campaign to update the 2017 / 2018 NSX fuel tanks and thermostats. ScienceofSpeed Sport Downpipes transform the sound of the Second Generation NSX while improving performance. May we suggest making "lemonade out of lemons". There are two bulletins: B18-050 (fuel tanks + thermostat) and B18-053 (fuel tanks only). You should speak with your local dealer as to which your VIN applies to. 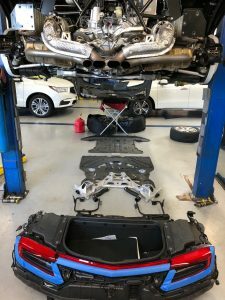 Installation time of the ScienceofSpeed Sport Downpipes can be reduced if completed as part of the recall, especially if the technician removes the rear bumper and trunk box as part of the installation (see photo below). It is up to your local dealership to determine if they are willing to do the downpipes as part of the campaign. ScienceofSpeed Sport Downpipes are in no way endorsed by the Acura Division of Honda Motor Company, or its affiliates. We will keep a list of dealerships who are willing. The ScienceofSpeed Sport Downpipes improve the Sports Sound and performance from the Second Generation NSX. Compared to the factory converter set, the converters have a larger cross section, less restrictive substrate design, a braised and captivated core, and a higher precious metal wash density for improved emissions performance. The downpipe assembly is fully constructed from stainless steel, including machined flanges, and USA manufactured stainless steel tubing and converters. 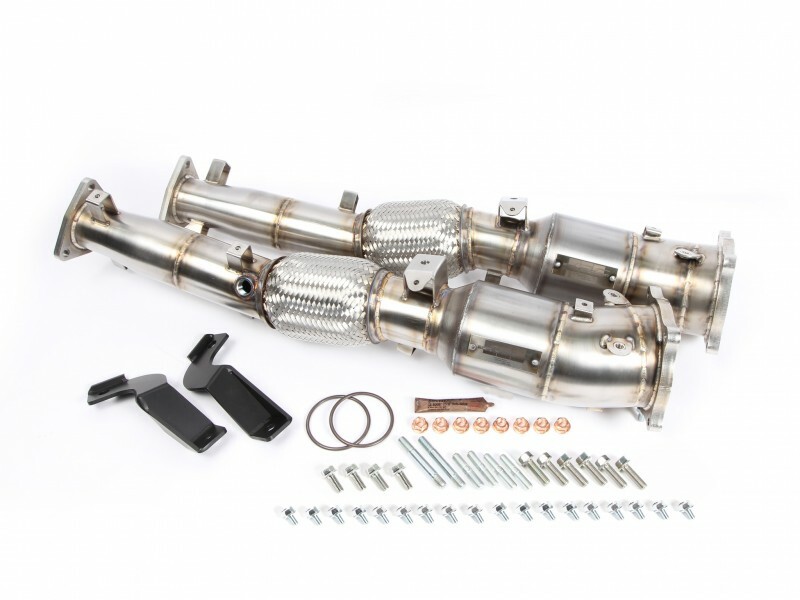 The ScienceofSpeed Sport Downpipes are the only design on the market that retain all eight factory catalytic converter and two turbocharger heat shields.